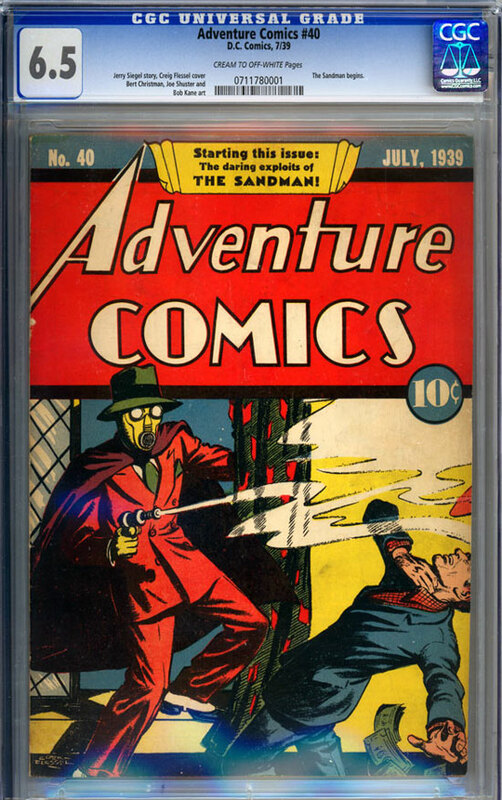 One of the top Golden-Age key issues, Adventure Comics #40 introduced the Sandman and is one of the most sought after and difficult issues of the entire Golden Age of comics. Cover art by Creig Flessel. Interior art by Bert Christman, Bob Kane and Joe Shuster. Jerry Siegel story. This copy is a very solid example, with great cover colors and eye appeal. It has minor corner wear and a couple small flakes of color missing at spine. Otherwise, it would certainly grade the best existing copy (a CGC 7.0 is currently the best certified). As is, it is still the 2nd best certified at Fine+ 6.5 and has very respectable pages for this rare issue.